It is likely that many of Glass’s admirers are unfamiliar with his work, one of the composer’s most significant and attractive. Music With Changing Parts was issued only on LP — two discs, packaged in an inexpensively made, grainy black and white cover, produced by Glass’s own semi-private Chatham Square label — and it has been out of print since the late 1970s. Moreover, the LP format required disruptive fade-ins and fade-outs at the beginnings and ends of sides, particularly damaging to the continuity of this music. And so this completely remastered, uninterrupted, compact disc release of the original recording of Music With Changing Parts should prove enticing not only to those who have never heard the work (and the Philip Glass Ensemble has rarely played it in recent years) but also to those of us who remember long-ago evenings like the ones described by Rockwell — the excited treks to downtown Manhattan. the welcoming informality of the atmosphere (in vivid contrast to the fierce concentration of the players), the sense that we had tapped into a new manner of listening, a new world of sound. 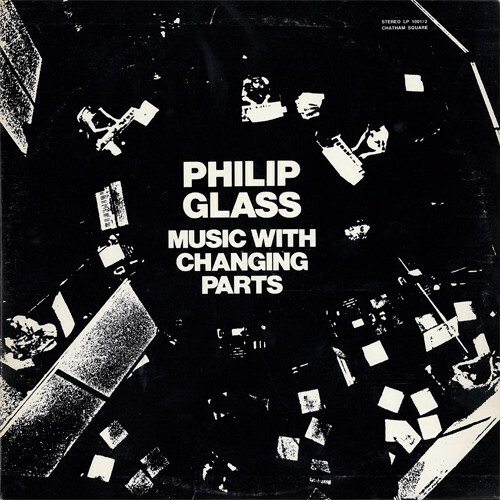 By the time Glass completed Music With Changing Parts, in early 1970, he had been performing with an early — and still metamorphosing — version of the Philip Glass Ensemble for about two years. Music With Changing Parts is constructed with the techniques Glass had developed in earlier works such as Two Pages, Music In Fifths, Contrary Motion and Music In similar Motion (all composed in the late 1960s and now available on Nonesuch). To the mix, Glass now adds a sense of the epic — Music With Changing Parts was plotted as an evening-length piece and some early performances went on for up to two hours — and he allows both himself and the players a certain impulsive, almost Romantic, creative freedom that is markedly absent in the stark, formalist rigor of the preceding works. The score is broken into brief modules; Glass, from the keyboard, “conducted” the ensemble with nods of his lead indicating it was time to move from one module to the next. Like most of the early pieces for the Philip Glass Ensemble, Music With Changing Parts was written in open score, with no specific orchestration. Instead, what Glass calls “unassigned lines” of music were divided up in rehearsals. The listener will notice some unfamiliar timbres (unfamiliar, that is, for the Glass ensemble) in this recording: the late Robert Prado is heard on trumpet and the composer Barbara Benary plays violin. While Glass would later assign the violin an important part in both Einstein on the Beach and The Photographer, it is used there in a soloistic manner quite different from the way it is blended among the winds and keyboards in Music With Changing Parts. Besides Benary, several other players in the ensemble (notably Jon Gibson and Dickie Landry, both of whom would be associated with the group for many years) were composers and Glass remembers occasions when performances were joined by, among others, Anthony Braxton, James Tenney, Richard Teitelbaum and Frederic Rzewski. Music With Changing Parts is about as close as Glass would ever come to two very different styles of music: modern jazz and “New Age.” Glass carefully controlled the improvisation in Changing Parts — as he did in Part IV of Music In Twelve Parts and the “Building” scene in Einstein on the Beach, the last of which remains far and away his “jazziest” piece — but it is there, nonetheless. Whatever prefigurations of New Age (a genre that, in 1970, had yet to be identified) we find in Music With Changing Parts evolve from the same source as the improvisation: Glass’s discovery, during a 1969 runthrough of Music In Similar Motion, that sustained overtones and undertones were following the patterns played by the ensemble like an aural shadow. Glass and the ensemble took Music With Changing Parts on tour throughout the United States and Europe in the early ’70s; one English audience included David Bowie and Brian Eno, who heard Glass’s music for the first time that night (and would collaborate with him some two decades later on the Low Symphony). A use of drones and repetition similar to that found in Music With Changing Parts would manifest itself in Eno’s work as early as 1973, with the release of the first Fripp/Eno album, No Pussyfooting and, thus reconstituted, would have a tremendous influence on much popular and New Age music of the ’70s and ’80s. Original music composed by Philip Glass. Philip Glass: electric organ, alto flute. Barbara Benary: electric violin, voice. Steve Chambers: electric organ. Jon Gibson: electric organ, soprano saxophone, flute, voice. Dickie Landry: soprano saxophone, tenor saxophone, piccolo, flute, voice. Kurt Munkacsi: engineer, electronics. Arthur Murphy: electric piano. Robert Prado: trumpet, flute, voice. From the Chatham Square Productions recording. Produced by Philip Glass and Klaus Kertess. Recorded 1971 at Martinson Hall of the Public Theatre, NYC by Butterfly Productions,Inc. Engineers: Bob Fries and Kurt Munkacsi. Mix by Kurt Munkacsi, Philip Glass and Dickie Landry. Reissue of original LP recording produced by Kurt Munkacsi and Michael Riesman for Euphorbia Productions, Ltd. Digitally remastered at The Looking Glass Studios, NYC using SoundTools ProMaster 20 and DINR by digidesign. Design by James Victore Designs Works. Cover photograph of Philip Glass, 1987, by Beatriz Schiller. © Dunvagen Music Publishers, Inc. (ASCAP). © 1994 Nonesuch Records.